ICC Champions Trophy 2017 is round the corner with warm-up games coming to a close. The 8th edition of ICC Champions Trophy will be held in England & Wales. Eight teams are divided into groups of four and will be playing three matches in the league stages. The first game will be played between the hosts England and Bangladesh who are making a comeback into the tournament after a long gap of 11 players, replacing West Indies. The first game will kick off at Kennington Oval, London. When and where to watch ICC Champions Trophy 2017 on TV? You can catch the live telecast of Champions Trophy 2017 games on Star Sports 1 & 1 HD from 15:00 IST. Only two games will be starting 18:00 IST, Australia vs Bangladesh and Pakistan vs South Africa. Where to watch live streaming of ICC Champions Trophy 2017? You can watch the live streaming of ICC Champions Trophy 2017 on Hotstar. ALSO READ: CT 2017 IND vs NZ, Warm-Up Game: MS Dhoni’s lightning fast stumping to dismiss de Grandhomme stuns Twitter! 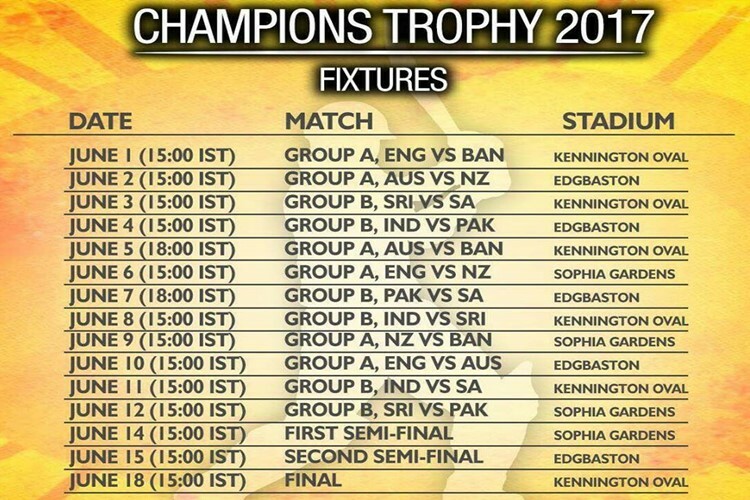 Here’s the full schedule of ICC Champions Trophy 2017, although, the most awaited clash is India vs Pakistan on June 4.